Ichiro joins only two other players in major-league history with 4,000 career hits. Is it there any doubt that Ichiro Suzuki is one of the greatest baseball players of all time? 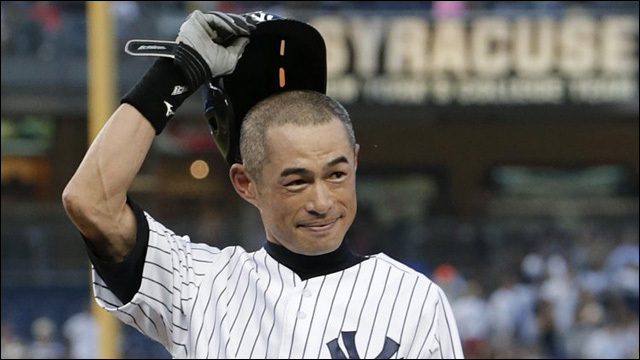 On Wednesday, with a mighty swing of his bat, the New York Yankees outfielder collected the 4,000th hit of his professional career: Ichiro Suzuki reaches 4K-hit plateau. There's a little twist, because the 4,000th hit reflects a combined total between his career in both the Japanese Pacific League and the American major league. But no matter how you slice it, the feat is impressive -- an exclusive benchmark that only two other players, Pete Rose and Ty Cobb, have reached. On Wednesday, Ichiro's 4,000th hit occurred when he singled to left off Toronto Blue Jays starter R.A. Dickey in the first inning. The game was stopped as Ichiro received a standing ovation. Ichiro's teammates bounded out from the home dugout and met him at first base to give him hugs and high fives. "It was supposed to be a night that was special to me," Ichiro said through a translator after going 1-for-4 in the Yankees' 4-2 win. "But you know what happened tonight, I wasn't expecting when my teammates came out to first base, that was very special. To see the fans, I wasn't expecting so much joy and happiness from them. That's what made it very special tonight. Not just the number, but all the things that happened with it. That came with it. It was very special." More here: Ichiro joins the 4,000 hit club.